One of the joys of FTL was that it was one of the few games that put your crew front and centre. When it came to battles, your attention was on maintaining the ship’s subsystems not flying about the vastness of space. The Mandate taps into a similar micromangement vein but under the umbrella of an RPG. It’s a little like Baldur’s Gate in space. 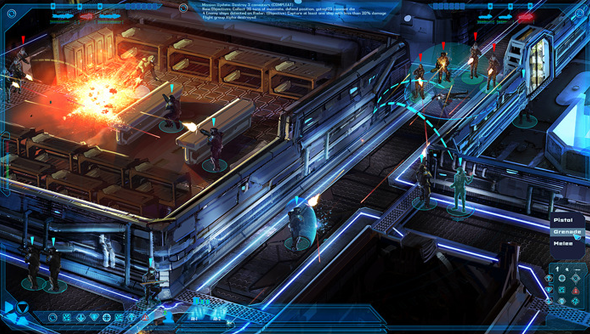 You captain your ship in an isometric view, chatting to your crew, receiving quests and shopping for items. You can board enemy vessels and fight pitched battles in the corridors and engine rooms, all in the same perspective. You can already try out the modular shipbuilder they talk about. There’s a lot of features going on in the game that, if they can pull it off, would make for an engrossing RPG. I can picture spending hours crawling through every inch of my ship, talking to my crew, finding out their backstories, and then flying out into the inky black to shoot at pirates. The ship to ship combat looks stellar, too. I spent hours on the old Starfleet Academy, piloting the Federation’s flagship. Getting it blown to smithereens and forcing all hands to go down with the ship. Good times. Plus, the whole game can be played in six-play co-op. The team are made up folk who’ve worked onAssassin’s Creed, Far Cry 2, Alan Wake, and The Secret World, so they come from good stock. Perihelion are looking to raise $500,000 and with 46 days left to go they’ve already raised more than $100,000. Fancy throwing them $400,000 or some number in between? You can!